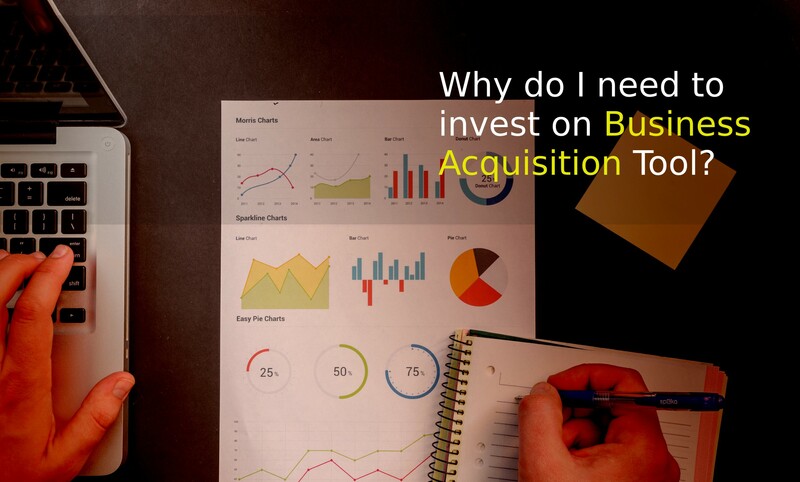 Why do I need to invest on Business Acquisition Tool? Business acquisition is not an easy task. Unlike buying a product there is no guarantee that it will work tomorrow. It requires critical thinking, patience, lots of investigation and analysis, and a certain amount of non-emotional interpretation. This required skill set is foreign to most would be entrepreneurs. The use of accountants or consultants to assist in evaluating a potential acquisition will provide insight and lay the foundations for understanding the consequences of the acquisition. Technology has come a long way in recent years and to some extent the evaluation of a business acquisition can now be done quickly and cheaply. Technology can’t replace the due diligence that should be undertaken but from a strictly financial perspective any acquisition can be reduced to simple numbers to determine whether the proposition is viable to consider further investigation. Previously, the process of crunching the numbers for a business acquisition generally involved spreadsheets, some financial modelling and some understanding of the way financial numbers work. This has been largely simplified into a Business Acquisition tool which will assist users in evaluating the financial suitability of the proposed business. It will also keep the business broker honest. What is a Business Acquisition Tool? A Business acquisition tool is software which allows its users to assess if a business for sale is a good investment or not. It will also determine the parameters you’ll need to change or closely monitor and the impact on bottom line cashflow or profitability. That could include effects such as variations to sales, changes to margins or overheads, and even what price you should pay to produce at least a positive cashflow, a great place to start with price negotiations. The software provides you with the insight into the possible outcomes of your business strategy. Knowing the financial outcomes allows you the flexibility of planning or determining resource allocation ahead of time. Knowing the worst that could happen allows you the insight to prevent negative outcomes and even will guide you to leverage success. Why is it important to invest Business Acquisition Tool? ● existing cash flow – You need to check that the business has existing cash flow to support operational needs and the business acquisition funding. This business acquisition tool will assist you in forecasting cashflow and profitability. ● enough to provide good living - It is important to determine if the business provides sufficient income to allow you to provide for your living expenses. Without a consultant or accountant to calculate the actual income of the business you could find yourself at financial risk if you don’t determine the financial implications of the acquisition. With a business acquisition tool, you’ll simply be able to determine if the business meets your personal funding needs. READ: How do I know if my Business Acquisition is making money?